Mixed Greens is thrilled to present Keith Lemley’s first solo exhibition in New York. He will present an arresting, site-specific installation that combines large Chestnut Oak sculptures with handcrafted neon, synthesizing the organic and the machine. Always interested in scientific research connecting disparate parts of the universe through underlying geometry, Lemley has become known for large-scale, angular neon installations that unify spaces through light, color, and line. More captivating than the actual geometric theories is the process of experimentation and discovery shared by scientists and artists alike. Lemley is intrigued by the next set of questions each installation poses and the challenge of uniting materials, light, and architecture within each exhibition. Approximately six years ago, a large Chestnut Oak tree fell on a ridge near Lemley’s studio in rural Appalachia. The trees in that area can be traced back to the early 19th century in spite of scarce nutrients and strong winds on the cliff. Lemley walked past this fallen tree nearly every day. Eventually, he began to carve the wood, exposing nearly two centuries of history. The shapes of the sculptures come from the knots, limbs, defects, and idiosyncrasies in the tree’s growth. Lemley works to reveal the underlying geometry in this natural material; he sees the cuts as a collaboration with the tree, uncovering an order and a narrative that was already there. 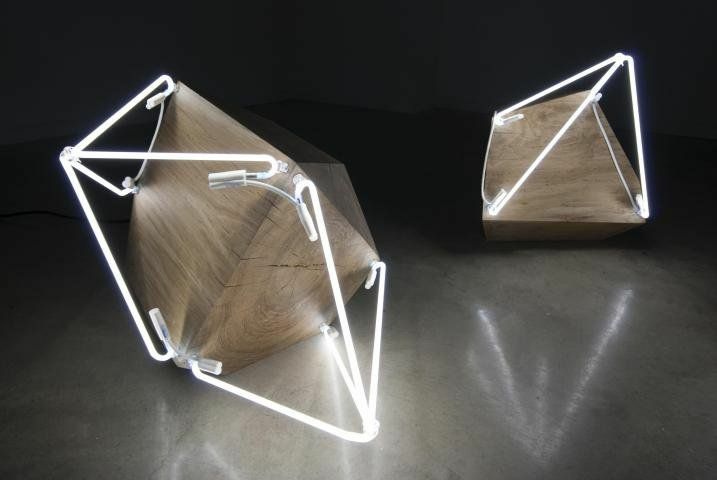 Neon tubes act as extensions of the wooden, gem-like forms. The lines of light become drawings in three-dimensional space, exaggerating shapes, drawing attention to characteristics of the wood, and imagining what could have been if the tree continued to grow and expand. The neon is a counterpoint to the wood formally, materially, and conceptually. Although the neon is light itself, it becomes a ghost of the carved wood. Together, the heavy wooden forms and the delicate, yet powerful, neon create an immersive installation for viewers, recreating the wonder Lemley feels when reading about a new scientific discovery or taking a walk through the woods.